HCTF is delighted to share an update from one of our more explosive recent projects, the Coquihalla River Summer Steelhead Migration Rehabilitation Project. 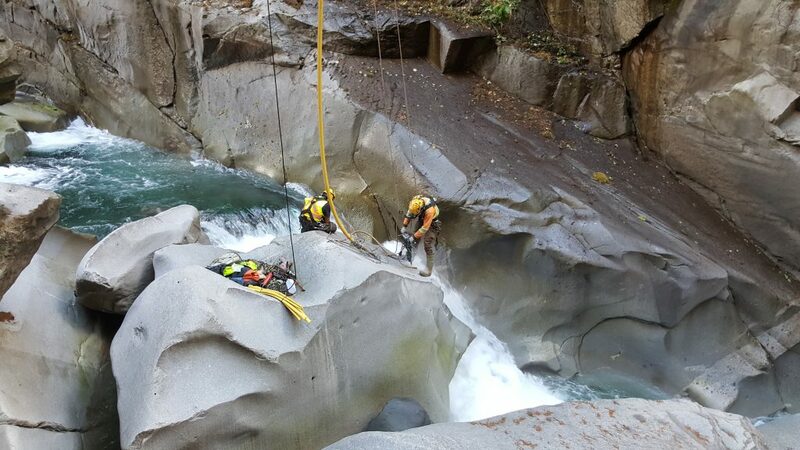 Crew working to break up boulder on Coquihalla River. In the spring of 2014, an unfortunate combination of erosion, shifting of boulders and the settling of a failed bridge foundation introduced a new obstacle for summer steelhead attempting to access the upper 20 km of the Coquihalla River. The location of Othello Falls, combined with seasonal water levels, have always made this stretch very difficult to pass, but the 2014 events made this barrier almost fully impassable. Loss of access to the upper river threatened the long-term viability of this unique steelhead population. In response, a dedicated group of biologists, engineers, conservationists, and fisheries enthusiasts came together to make a plan. Northwest Hydraulic Consultants was contracted to oversee modifications to the barrier. In September 2017, the team rappelled down the bridge at Othello Falls, drilled holes in the most problematic boulder, and used low-impact explosives to break the blockage into smaller pieces. Over the winter, high water flows redistributed the rocks, creating a more accessible passage for steelhead. The Coquihalla River supports one of only two natural, coastal summer-run steelhead stocks on the lower Fraser River. This stretch of river provides a rare opportunity for artificial fly-only summer steelhead fishing. From both a conservation and recreation viewpoint, individuals and organizations from across BC are very keen to support this important piece of habitat. HCTF is keen to follow the monitoring updates from the talented and creative folks on the ground and in the water at the Coquihalla River. This project was supported by the Freshwater Fisheries Society of BC, the Steelhead Society, Kingfisher Rod and Gun Club, the BC Conservation Foundation, BC Parks and the Ministry of Forests, Lands, Natural Resource Operations and Rural Development.